Scott first became intrigued by martial arts when he watched Royce Gracie defeat much larger opponents in the first UFC tournaments. His search for a place to train led him to Chris Dewey and the Starkville Martial Arts Academy where he discovered both a passion and an aptitude for Judo. Scott competed in Judo for many years winning a state championship and attaining a national ranking. 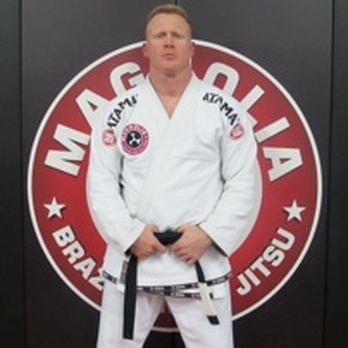 After moving to Houston to become a Houston Police Officer, Scott’s focus and passion shifted to Brazilian Jiu-Jitsu where he started and continues to train with Tony Torres-Aponte at Urban Jungle Self Defense. Scott has had success in Jiu-Jitsu and grappling tournaments as well as in the MMA arena. While attending the United States Military Academy, Mike was an intercollegiate competitive powerlifter, but also competed in wrestling and boxing for his company. Always interested in fighting and martial arts, it wasn't until 2000, when Mike was in law enforcement, that he was invited to attend a Jiu-Jitsu class at Urban Jungle Self Defense. Even with a powerlifting/wrestling/boxing background, the Jiu Jitsu practitioners easily defeated him, even at smaller sizes/weights. Mike knew that he wanted to learn everything that this art could offer and has been actively involved in Jiu-Jitsu ever since. Brent is a former U.S Marine and started training Brazilian Jiu Jitsu under Fabricio Amaral in 2007. In 2011 Brent started training under Master Octavio Couto where he has earned the rank of Brown Belt. Over the last 7 years he has competed in IBJJF, Naga, Fight To Win, and other tournaments. Brent has traveled to Brazil on several occasions to train and learn Jiu Jitsu. Doug has been practicing Judo for over 20 years and is a National Judo Coach through the United States Judo Association. Doug also runs the kid's Judo program and has four kid's who all do Judo and Jiu-Jitsu.